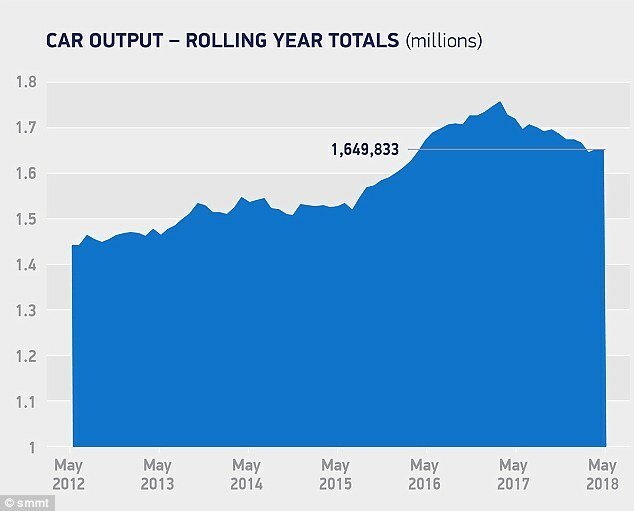 UK car manufacturing grew for the second consecutive month in May, with production increasing by 1.3 per cent, official figures showed today. A total of 137,225 new cars emerged from UK assembly lines last month, helped by an increase in home demand of 13 per cent year on year. However, production of vehicles for export was down by 1.5 per cent in the wake of mounting concerns that the manufacturing sector would be crippled if no trade agreement is put in place with the EU by the time Brexit happens. UK car factory outputs for the year so far currently stand at 705,603 units, which is still 2.9 per cent down on the same period last year. April’s rise of 5.2 per cent marked the first increase in vehicle manufacturing after months of dwindling demand for UK-made motors. The Society of Motor Manufacturers and Traders (SMMT) said the year-on-year increase in May was due to a ‘marked decline in the same month last year’ that was caused by ‘several plants adjusting production schedules to prepare for a raft of new and updated models’. The motor industry body also highlighted that production had sunk a year ago on the back of VED reforms that made most new models more expensive to tax. This, along with fresh talk of potential crackdowns on diesel models coming to the fore at the time, heavily impacted the home demand for new motors in May 2017. However, it’s concerns for exports that has sector insiders panicked today. Production for overseas markets dipped by 1.5 per cent in May – though that could be just the tip of the iceberg if no trade agreement with the EU is put in place as part of Brexit discussions. As it stands, four in five cars made in the UK are exported, showing the UK motor manufacturing industry’s dependence on overseas markets. Mike Hawes, SMMT chief executive, said: ‘For this to continue, we need to ensure UK car plants are able to attract future investment, and this will depend upon maintaining the competitive conditions that have helped drive the industry’s success in recent years. 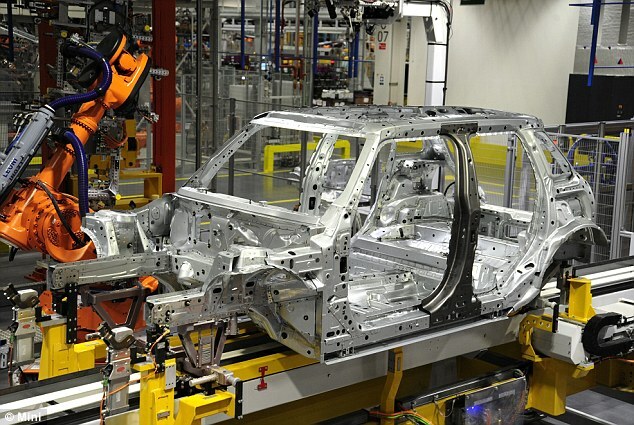 According to the motor trade representative, fresh investments in UK vehicle manufacturing has halved in the first six months of this year as car makers bulk at increasing their UK footprint while Brexit uncertainty looms. Investments in facilities and model development fell to £347.3million between January and June this year, down from £647.4million in the first half of 2017, the SMMT said in a report released earlier this week. It blasted Prime Minister Theresa May’s government’s ‘slow pace of negotiations’ and dubbed the proposed plans for trade after Britain leaves the EU as ‘unrealistic’. 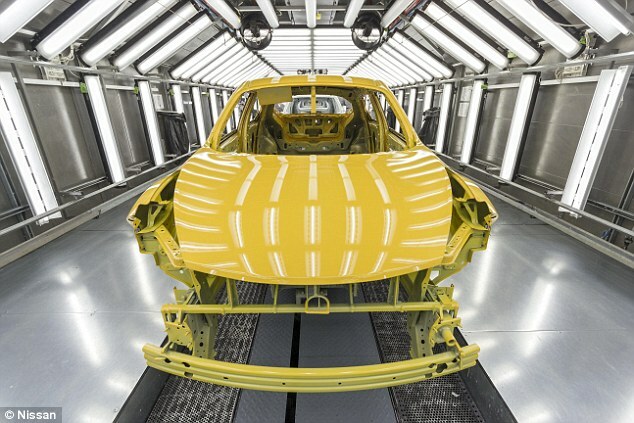 Ana Nicholls, lead automotive analyst at the Economist Intelligence Unit, said: ‘There’s no doubt that the automotive industry is going to be among those hardest-hit by Brexit, given the integrated nature of EU supply chains.